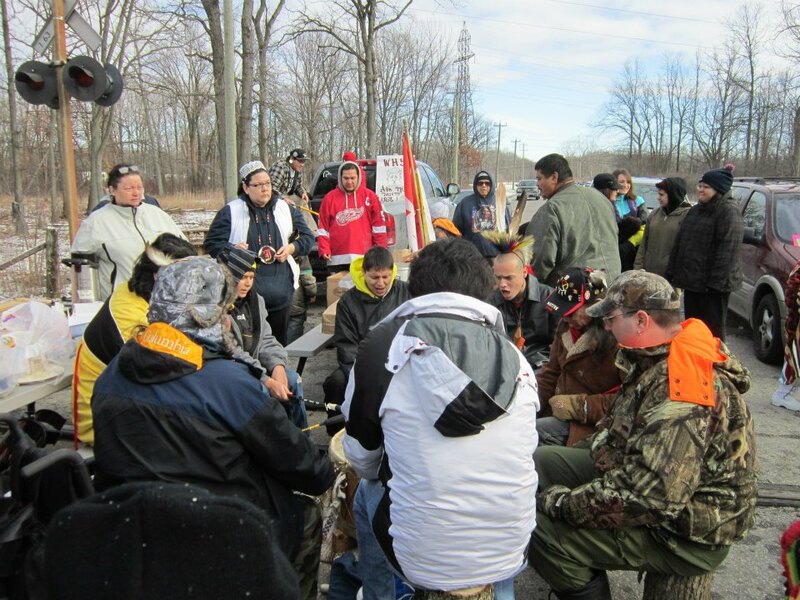 Drum group at Sarnia CN rail blockade, Dec 23, 2012. Use of social media, the spread of “citizen journalism,” and the involvement of young people are among the key trends highlighted by a federal analysis of protest activity in Canada over the last half-decade. A growing geographic reach and an apparent increase in protests that target infrastructure such as rail lines are also boosting the impact of demonstrations, says the Government Operations Centre analysis, obtained under the Access to Information Act. The Canadian Security Intelligence Service included the spring 2014 risk forecast in materials prepared for two meetings of the deputy ministers’ committee on resources and energy last April. The meetings were driven by the federal government’s desire to plan for protests that might happen in response to resource development decisions on projects such as the Northern Gateway pipeline. The newly released documents heighten fears about government anti-terrorism legislation that would allow much easier sharing of federally held information about people, said Josh Paterson, executive director of the British Columbia Civil Liberties Association. The operations centre — an Ottawa-based hub that would figure heavily in responding to a national emergency — based the forecast for the spring and summer protest season on statistics gleaned from more than five years of significant demonstrations in Canada. It also drew on the results of an April 2014 meeting that included nine other federal partners. It found demonstrations generally fell into four primary issue categories: social, political, environmental and First Nations. The “notoriety and success” of civil society efforts such as the Arab Spring, the aboriginal Idle No More movement, the Occupy protests, and anti-pipeline demonstrations have inspired Canadian citizens to start grassroots initiatives and make their voices heard, the study notes. Few demonstrations rise to the level of national interest, and most are peaceful and short-lived, the analysis adds. The operations centre predicted a low risk during the 2014 protest season, with the possibility of medium-level events — such as disruption to transportation routes. Officials felt opposition to pipelines and oil-and-gas fracking, as well as broader environmental and aboriginal issues, could lead to “large, disruptive, or geographically widespread protests” but no one had information to indicate “significant organizing activity” in this regard. Engagement of youth by issue-related movements established in the last five years. For the operations centre, it means that individual protests once considered unimportant “are now noted” due to their potential to spawn supporting demonstrations in other towns and cities. As an example, the analysis points to a one-week aboriginal blockade of a CN rail line in Sarnia, Ont., in December 2012 that disrupted delivery of chemical supplies. The Via Rail passenger corridor in central Ontario was also the focus of protests, and ports of entry, such as the Blue Water Bridge in Sarnia, were targeted. The systematic monitoring of peaceful demonstrations outlined in the memos is likely unconstitutional, as it creates a chilling effect on freedom of association, said human rights lawyer Paul Champ. The federal operations centre’s monitoring of protest activity stirred concern last year when the NDP accused the government of using the agency to spy on demonstrators. Roxanne James, parliamentary secretary to the public safety minister, defended the centre’s work at the time, saying it monitors any event that may pose a risk to citizens. Posted on March 18, 2015, in State Security Forces and tagged Canadian Security Intelligence Service, csis, Idle No More, native blockades, native protests, protests, surveillance. Bookmark the permalink. 2 Comments. This behavior on the part of government is exactly why we must stop the militarization of the police. We saw in the 1930’s in Germany and the USSR what happens when government becomes afraid of its people and begins consistent patterns of lies and feels required to defend itself from its people. That one resulted in forty to fifty million deaths. I hope we learned then that we absolutely must create a government that is accountable to the people. Lincoln’s pretty little rhetorical flourish about “of the people, by the people, and for the people” was just a pretty little rhetorical flourish.